Bharti Airtel has been in to hyper active mode ever since Reliance Jio entered the telecom market. After giving tough competition in the telecom space, Reliance Jio is all set to enter the Broadband arena. 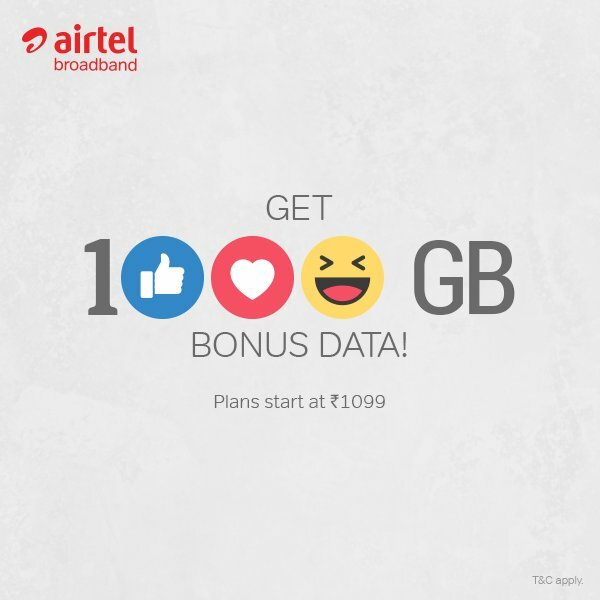 Keeping this in mind, Bharti Airtel has announced Broadband Bonus Data Online Offer offering up to 1000 GB extra data for its broadband customers. Airtel customers in Delhi NCR circle only are eligible for the offer as of now, airtel might extent the offer to other parts of the country after analysing the response it gets in capital region. The Broadband Bonus Data Online Offer is available since 16th May 2017 and is available to only new customers joining Airtel Broadband and on bookings made via www.airtel.in/broadband. Upon expiry of a period of 7 days following the date of activation of their new connection, a customer shall, subject to feasibility at the point of connection, be able to enjoy additional 65 GB/100 GB of internet per month as per rental, in addition to the base plan chosen by them, which may be enjoyed at the same speed as per chosen base plan. Bharti Airtel customers opting for Monthly Rental of Rs. 1099 and above would get 1000 GB extra spread over 12 months and if the Monthly Rental is below Rs. 1099, a user would get 750 GB per year. This data is over and above the regular monthly entitlement that you would have got if this offer was not there. Also all Airtel customers would also get Unlimited Local & STD calls as well. Please make sure to book for the Broadband connection online to avail the Extra Data Offer.